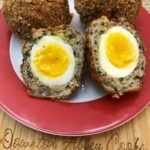 Scotch eggs are a popular menu item on pubs across the UK, which is simply a hard boiled egg enveloped in sausage meat, then fried. They first appeared in the 19th century and while they were first served hot with gravy, they are now more likely enjoyed cold with cheeses and pickled onions. Place 4 of the eggs into a pot filled with cold water, then bring to a boil. Boil for 3 to 4 minutes, then move to a bowl of cold water to cool. Peel once they have cooled and put aside. Cut open the sausage casings and squeeze the sausage meat out into a bowl. Add the herbs, season with salt and freshly ground pepper. Get your hands in there and mix so all the ingredients are well incorporated. Then form into 4 equal balls. Set up up an assembly line. start with your meat balls, then one flat container with the flour, one with the remaining egg (beaten), one with the crumbs. At the end of the line place a large plate. Lightly flour your hands so they won’t be sticky. Place one of the balls in the palm of on your hands, then flatten. Roll a peeled egg in flour, then bring the sides of the meat around the egg and seal. Roll the egg in the flour, then the beaten egg, followed by the crumbs. Repeat the egg wash and crumbs which will give you a a nice coating. Place on the plate and repeat with the other 3 eggs. Using a metal slotted spoon, lower 1 or 2 eggs into the pot, cooking until golden, rotating occasionally if your eggs touch the bottom of the pot. Cooking should take 3 or 4 minutes. Remove with a slotted spoon and drain on your plate with paper towels. The proper way to eat scotch eggs is to cut in half or quarters. It is not meant to be eaten like a hand food!